I received this deluxe sized sample in my recent Ulta haul with my Smashbox purchase. Now I've only had one other sample of a BB cream and it was too tiny to do a review with but I didn't like it all I thought it made me look like a glittery fool. This product on the other hand is actually quite impressive. If your not familiar with BB cream it is pretty much one of those hybrid products that multi task. It can Prime, Even out your skin tone, Protect from the sun, Moisturize, and Control oil all in one or at least that is what the western versions do. BB Cream is really popular over seas and there's are slightly different, for now we'll just stick with what this one does. Now as you can see this color does not match my skin this is in the shade Light. I really needed the shade Fair but that wasn't offered as a sample when I made my purchase. For sake of review and so I could tell you guys more about it I wore it anyway around my house. Let me first start with even tho it doesn't match my skin it does blend really well and is quite lightweight on the skin. In the picture I blended up with my fingers and it really looks like it might be a match but on my face its quite obvious this is not my color. 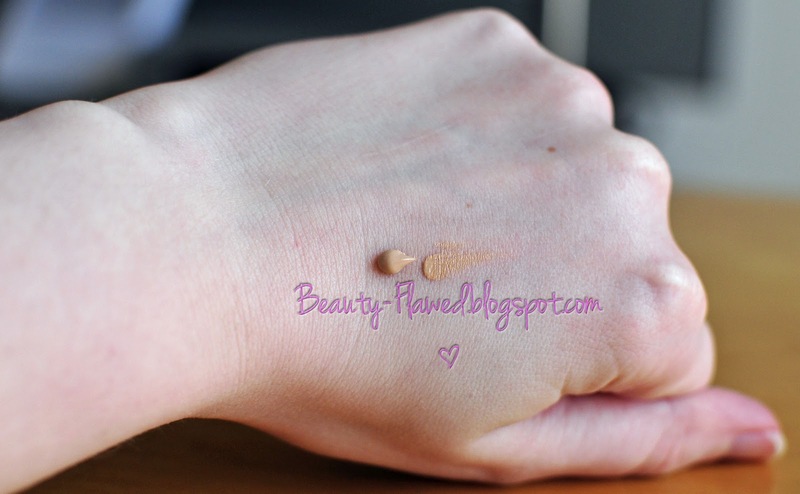 This shade has more of a yellow/warm undertone to it that might make it hard to match to certain skin tones. The formula on this is quite impressive it stays on well and didn't transfer to my clothes or anything throughout the day. It feels like a mix between a liquid foundation and a tinted moisturizer not quite liquid but not quite lotion. As far as moisturizing the skin I don't think it does much and I did have to apply my regular moisturizer before putting this on otherwise it looked flaky on my dry spots. It also didn't make me look oily even after 8 hrs of wear which I thought was pretty good because even tho I don't have oily skin I do sometimes get a little oily in my T zone after wearing makeup all day. I really liked that a little bit of product does go quit a long way I used a portion that was smaller than a dime and it covered my entire hand. I suggest starting off with little drops of this and working your way around to cover your whole face, otherwise it might end up being messy. One thing I didn't like about this was when applying it smells like straight up sun screen. This isn't necessarily a bad thing because the smell does go away once it dries BUT I hate the smell of sunscreen so it wasn't the most pleasant. It's great that it has an SPF 35 in it but I would have preferred it to have some other scent besides icky sunscreen or even been somewhat fragrance free. I'm definitely interested in trying their Fair shade and I think next time I'm close to a Sephora I will see if it matches better and if it does I would probably pick it up . 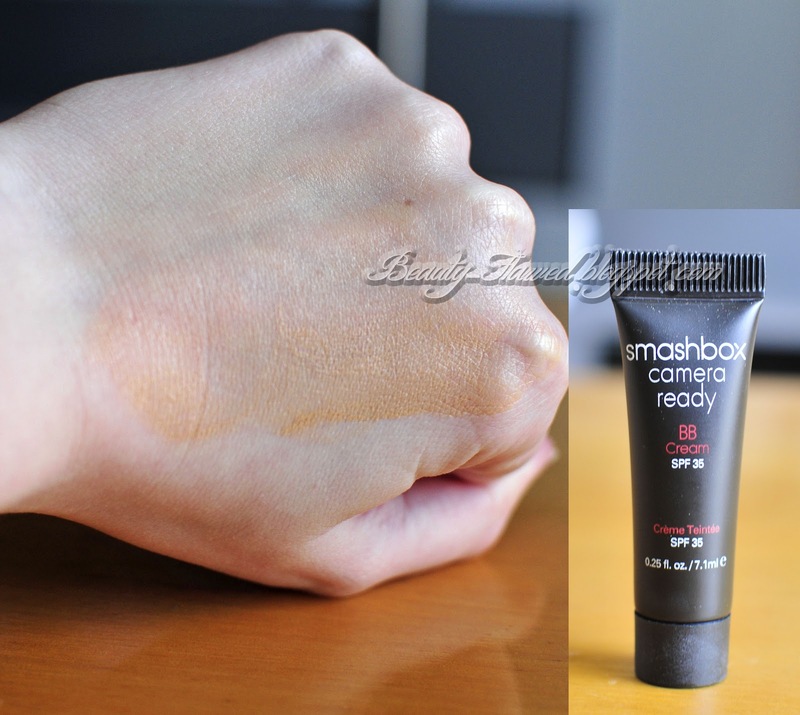 This is available in 5 shades which is quite a range compared to other BB creams that are on the market right now. It retails for $39.00 for 1 oz and can be found at Sephora right now and it will be coming to Smashbox's website and Ulta April 1st, 2012. Do you use a BB Cream? P.s. How do you guys like the new header and layout? I tried this one out too and I loved it. I felt like it made my skin feel really soft, haha. I tried this today and was surprised that it smelled of sunscreen so strongly! I know it has sunscreen it but WHOA... it was a little much for my taste. I was really impressed with the consistency and coverage, though! My local store doesn't have it in stock yet so I haven't purchased yet but I'm definitely considering it once it's available.